All but done with only two games left. Looking forward to getting out! With relegation, and subsequent sacking, all but confirmed, I headed into September with Sud América with just pride to play for. Thoughts: No words for this, the match recap does the job. Recap: There we go, glad to get out of there to be brutally honest. 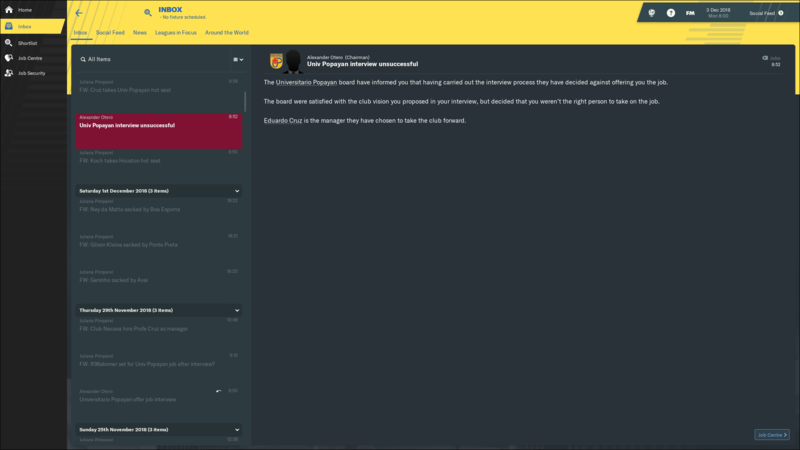 After all that, I was sacked for failing to reach a points target - which was set by the past president, with the new president explicitly stating he was only going to judge from when the he took over (i.e. no points target) - yet, he sacked me for the points target. 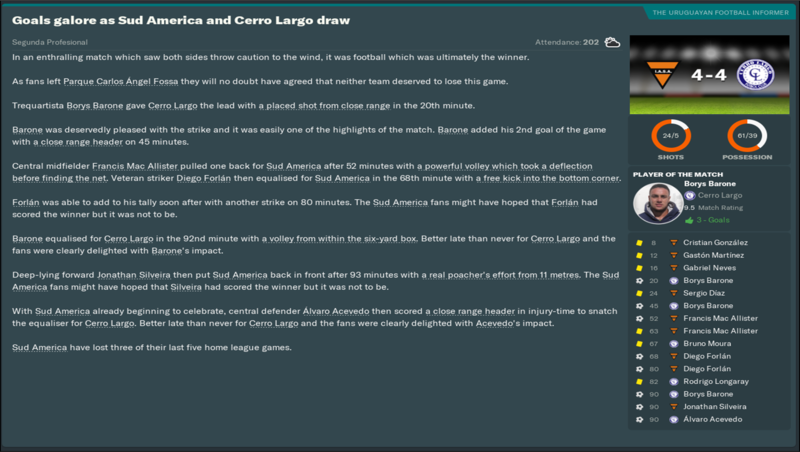 Can we just take a moment to see that Cerro Largo match though, that ending was just tremendous. 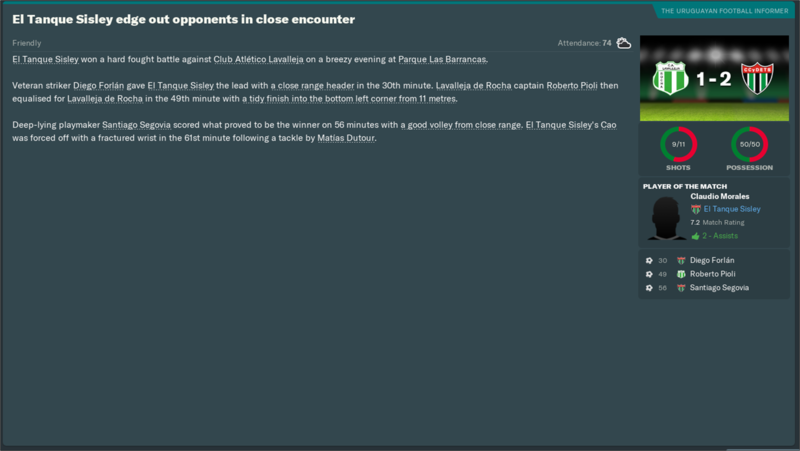 You'd never know I was on "very defensive" throughout the whole of that, including Cerro's third goal which can be seen below - gotta love that "very defensive" defending... as well as Cerro turning into Barcelona with the instant one-touch passing! Oh well, that's the downside of playing with the bottom end clubs - it really shows off FM's iffy side. All part of the 'fun'. 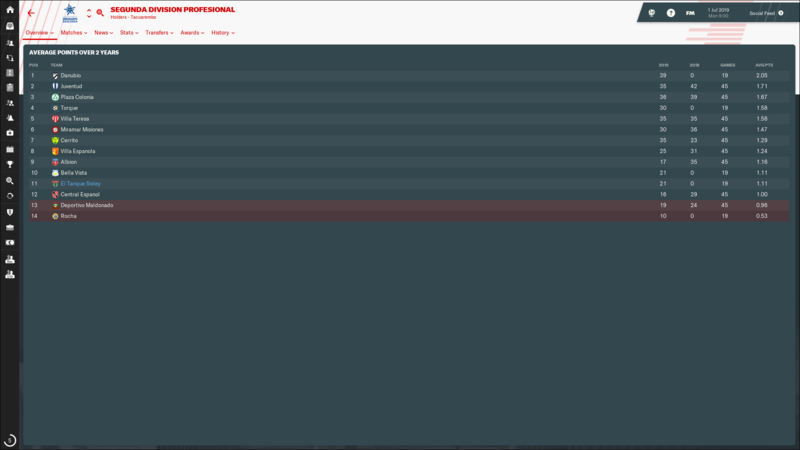 The game, for some reason, isn't awarding the relegation to me on my manager profile, but I'll still add it here. 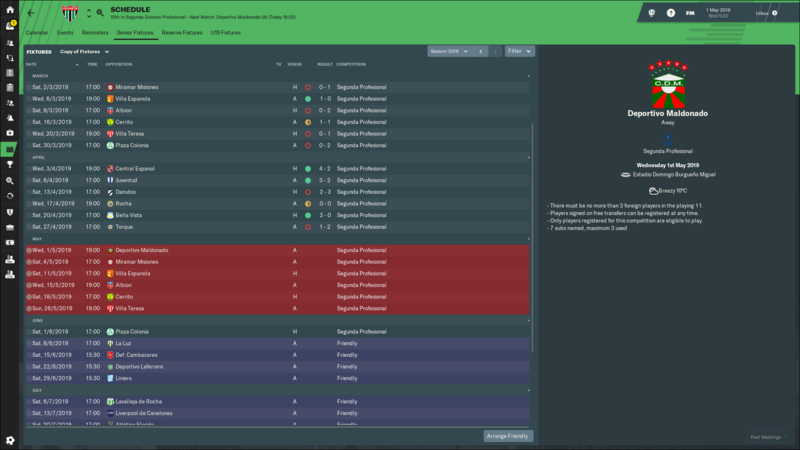 I think as it was an average points table, the game can't work out when a team is relegated? Who knows. Onto job number two! Thanks for reading! Definitely helped, the downs make the ups more enjoyable anyway! 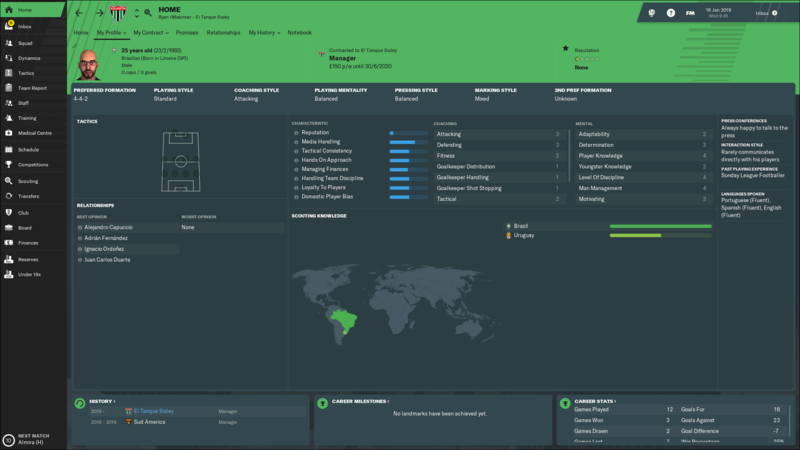 After getting sacked by Sud América, I went in search for job number two of this Journeyman save. 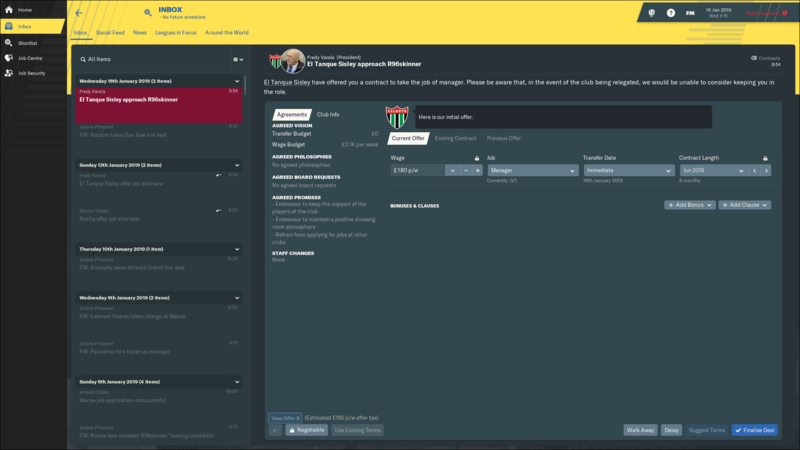 I had no thoughts on where I wanted to end up in North/South America, but I just went with the flow and applied for the jobs I saw fit. Here's how it went. 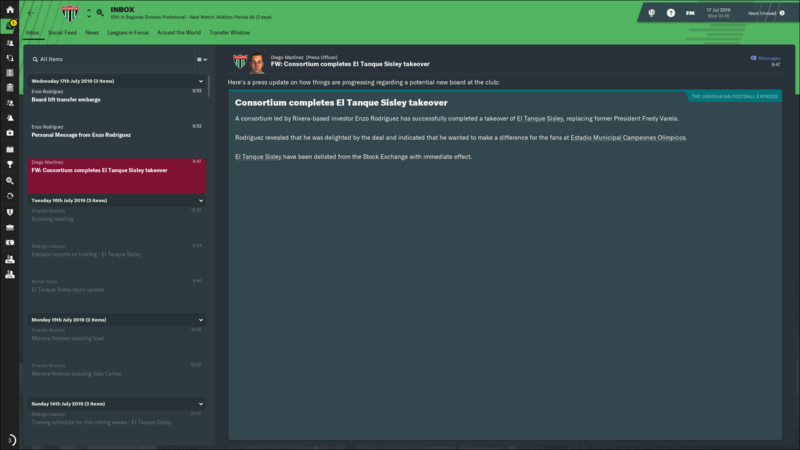 I am the new manager of El Tanque Sisley! 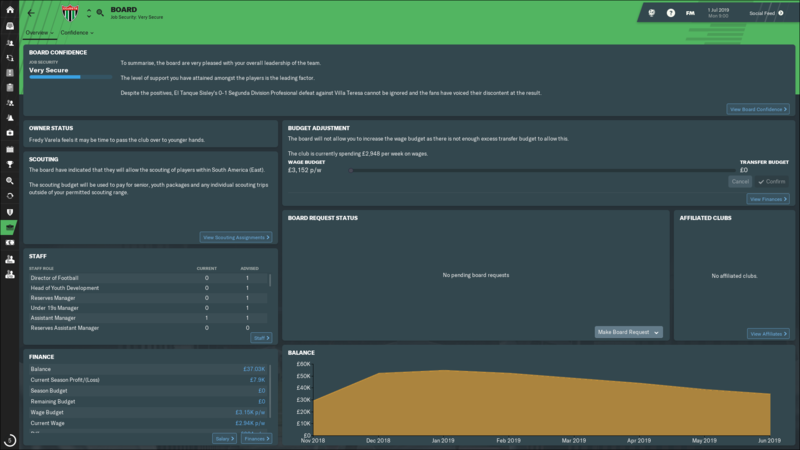 I have returned to the Uruguayan Segunda División. 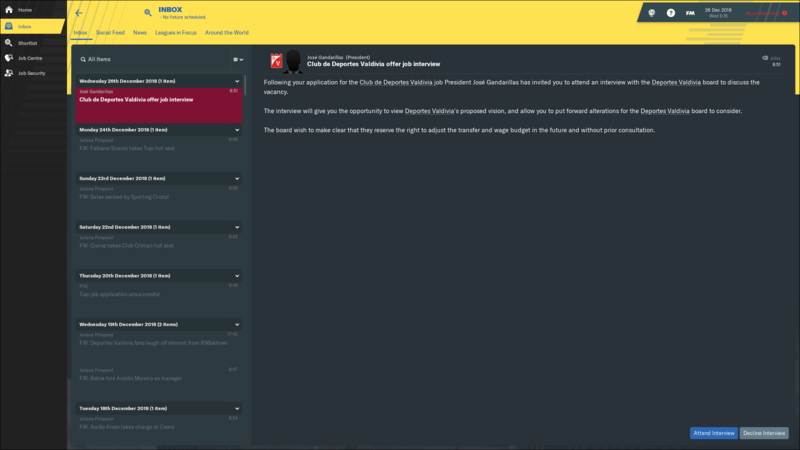 I hadn't planned to, but after struggling to get any real interest from elsewhere and actually thinking it through, I was interested in going back. 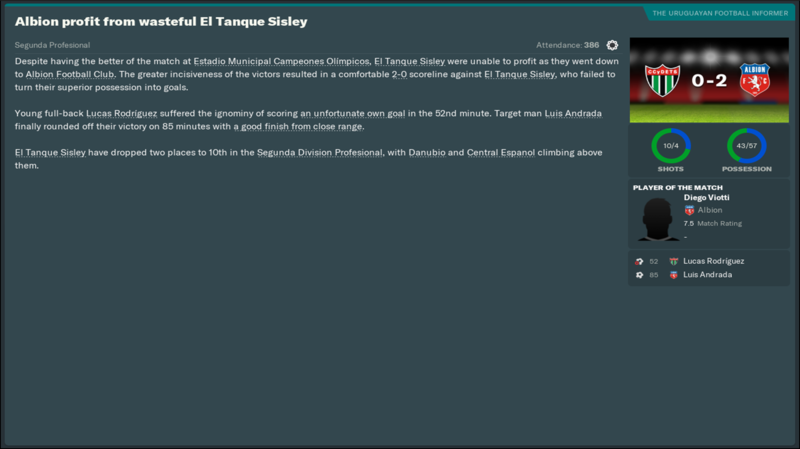 El Tanque Sisley are a really interesting club to take over. 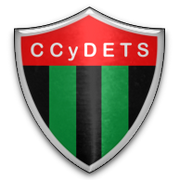 They are newly promoted* from the Segunda División Amateur (tier three), but were in the Primera División as recently as 2017. How? you may ask. 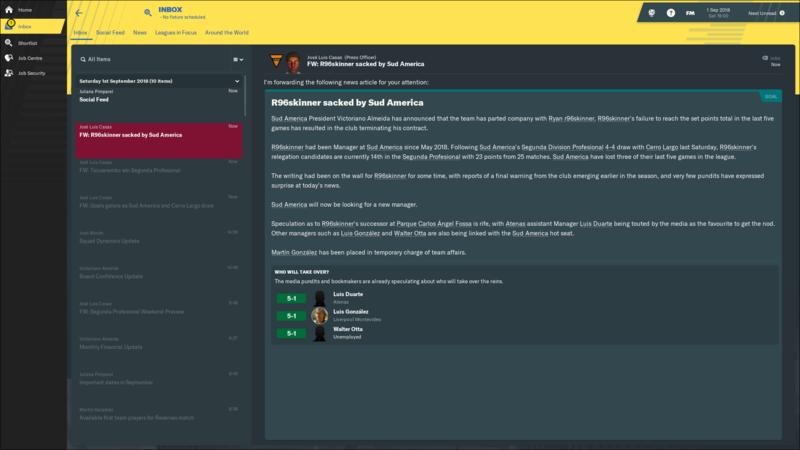 Well, in 2017 (in real life) they finished off fourth bottom, level on points with, of all teams, Sud América so went into a relegation play-off to see who would be relegated. 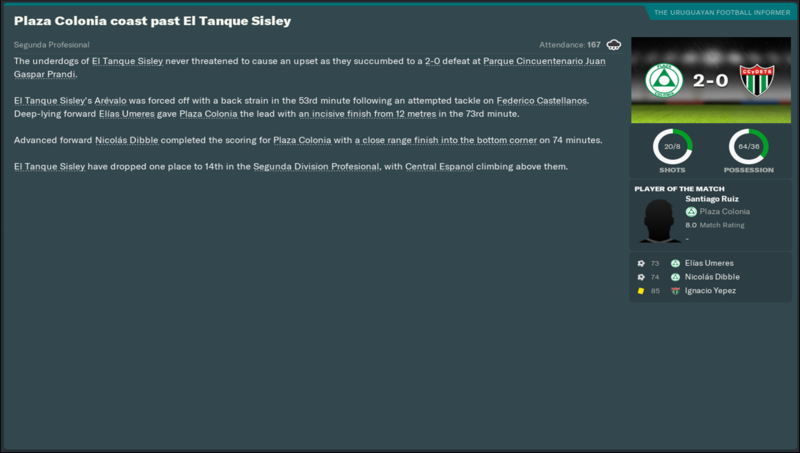 El Tanque Sisley won and survived the drop, but at the beginning of 2018 (again, real life), they were demoted to the second division for 2019 due to outstanding debt. I assume that's what FM has done, though their reputation is the same as Rocha (newly promoted) *so FM may see them as a promoted team rather than a relegated one. As I mentioned, I kinda wanted to avoid this league due to the average points table, but after thinking it through I decided to return as I'll have a full pre-season to build with; rather than joining perilously in mid-season like with my former club. 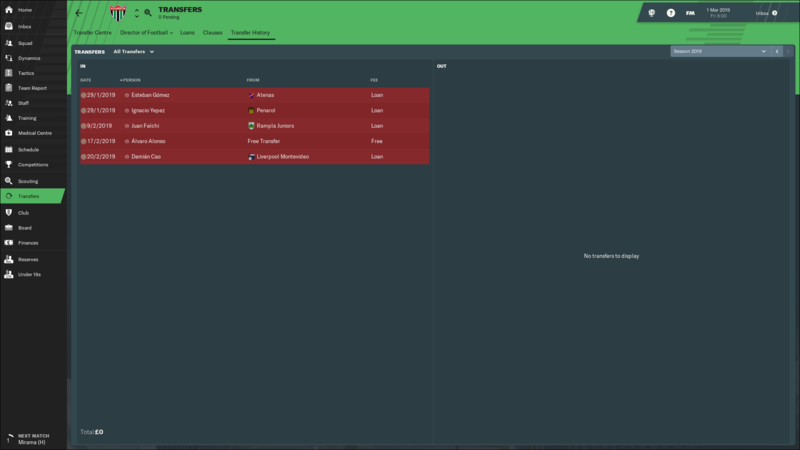 So, Uruguay - take two! Above you can see the embryonic league table and fixture list, as well as the squad and my manager profile behind the spoilers. Work to do, but I'm looking forward to this; a new job always brings excitement. Glad you've got yourself a new job so soon. Haha, it turned a would be infuriating moment into quite an amusing one. Cerro Largo's manager must be Mr. Guardiola in disguise! Indeed! I'm hoping the pre-season will help, then I can use the 'joined mid-season' excuse for Sud América! New job. 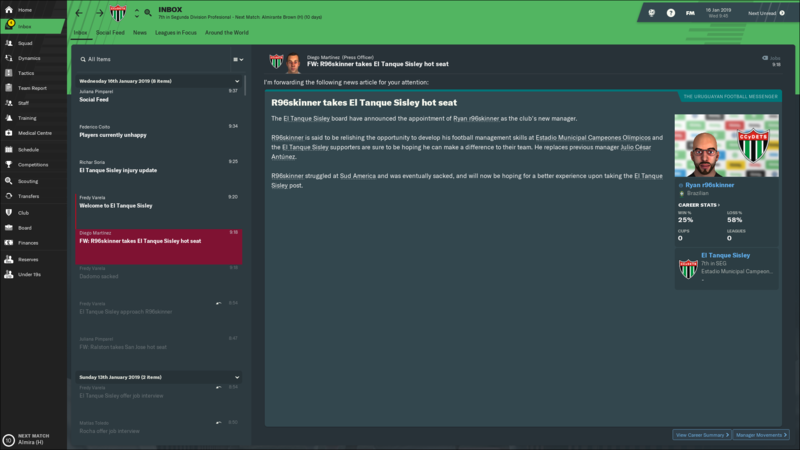 El Tanque Sisley have given me another crack at Uruguayan second tier football, as I was hoping for better than what happened with Sud América. 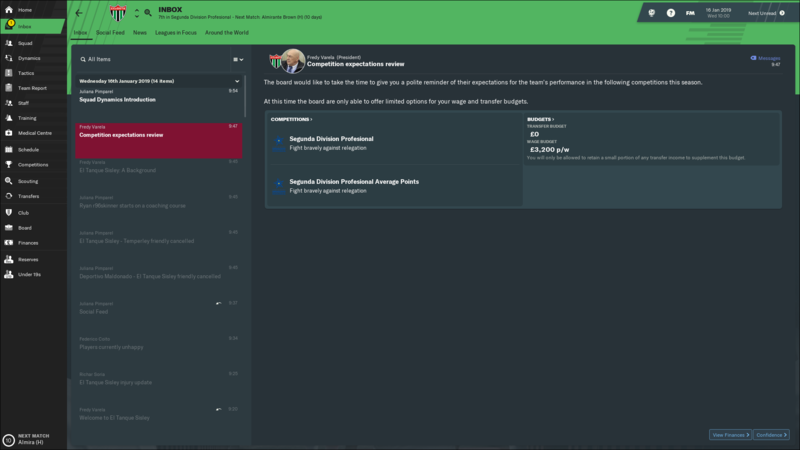 This time I have a full pre-season to put my stamp on this team. Thoughts: Tricky first test against a decent Argentine outfit, who deserved to win despite the scoreline flattering them a little bit. Thoughts: This is a match we should've won, instead we let a lower division club take the victory; though we were the better team. Thoughts: Another opponent from Argentina, who also beat us after a quickfire double in the second half. Harsh defeat. 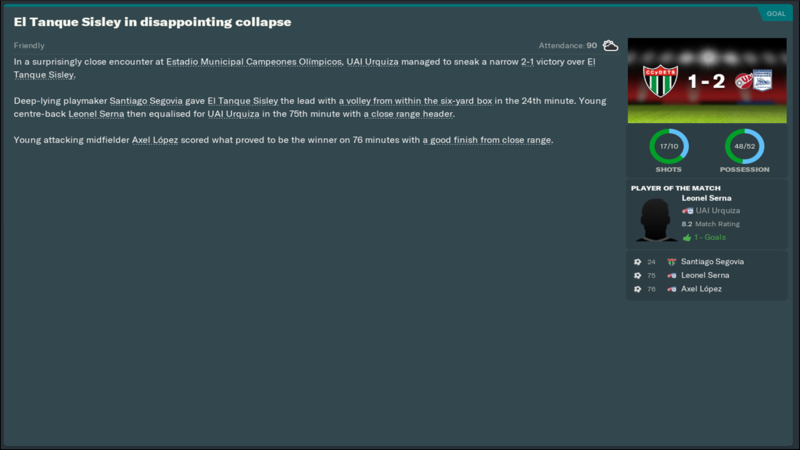 Thoughts: A late collapse costs us a friendly win, just like against UAI Urquiza. Frustrating. 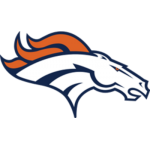 Thoughts: Victory, at last. Ironically, we were the ones who scored late goals to get the bragging rights. Recap: Not the most promising pre-season, but I'd say performances were a tad better than the results suggest. I was also tinkering every game with tactics, as this team wasn't really set for any immediate tactic so had to test a few things out. 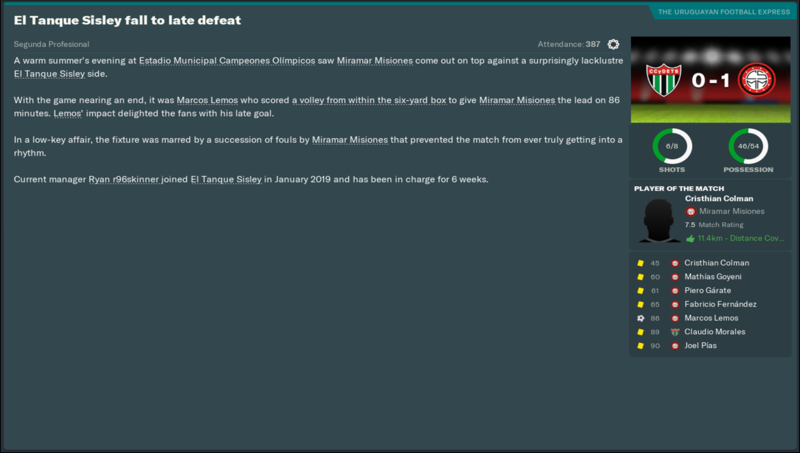 I've stuck with a defensive tactic, seemed to help in the final few friendlies but the acid test will come in our opening league fixture against Miramar Misiones. 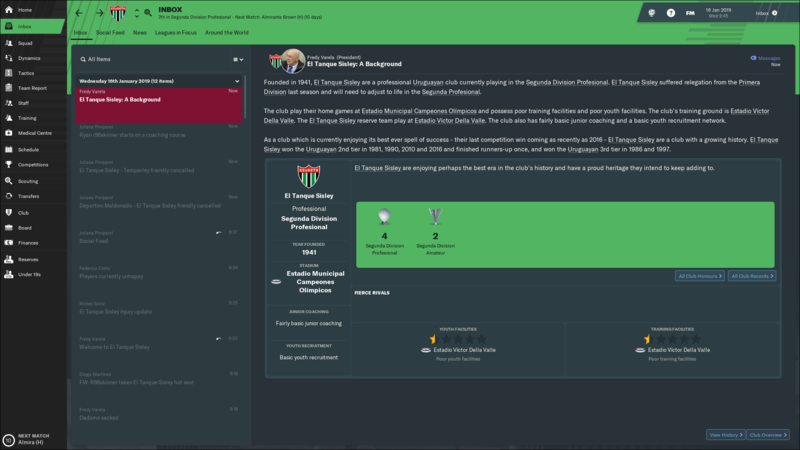 Us and Miramar Misiones are two of the fourteen teams taking part in the Segunda División for 2019, very interesting to see four-time Primera División champion Danubio as a competitor this year after they were relegated from the top-flight in 2018. It's hard to predict what will happen, I'm expecting a relegation battle all season long but we will see. 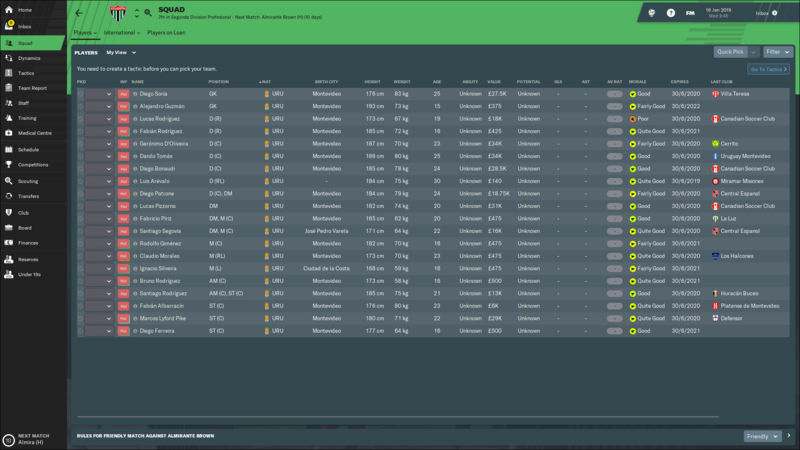 Off the pitch, I've made a number of signings. 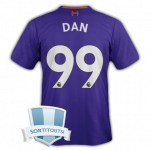 I also planned another, which would've seen me reunite with one Diego Forlán. However, despite agreeing everything on the morning (around 8am, acc. 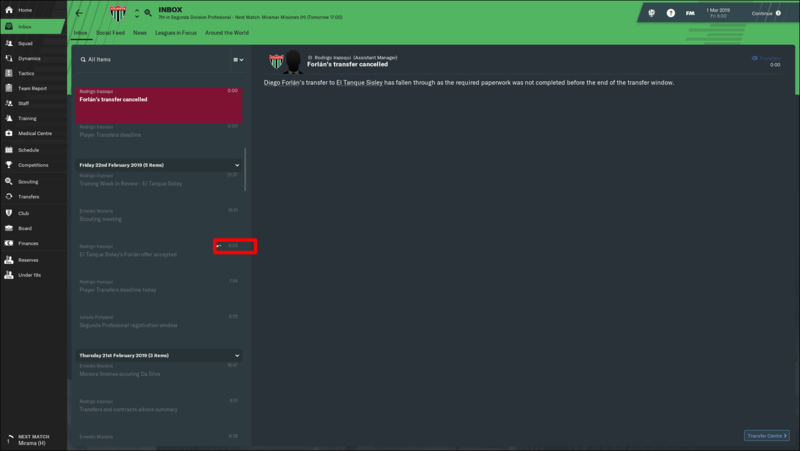 to game) of deadline day, the deal somehow didn't manage to go through by midnight. Ridiculous. 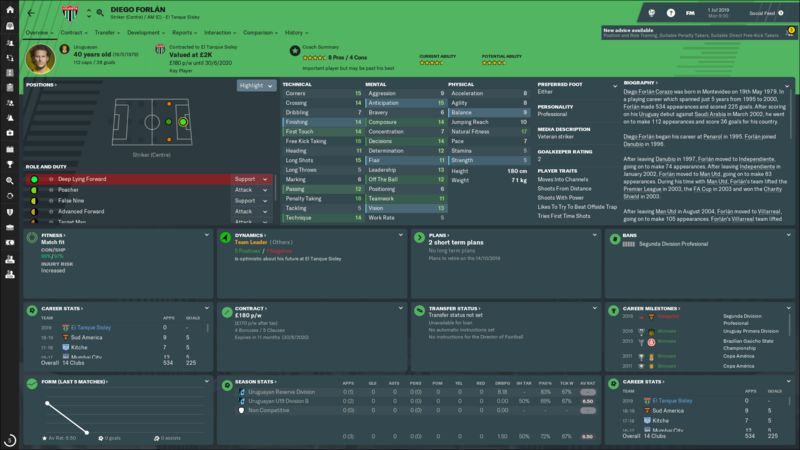 I've managed to sign him on a pre-contract, but he now wont join until July - missing over half the season. 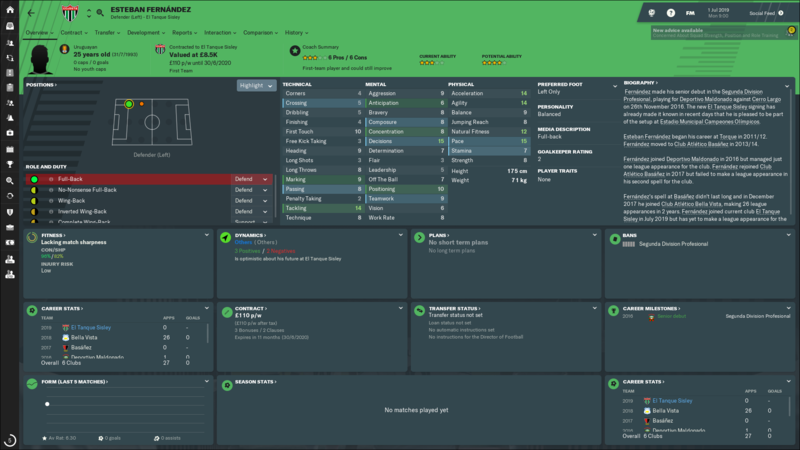 I bet he'll get injured at some point when joining too! 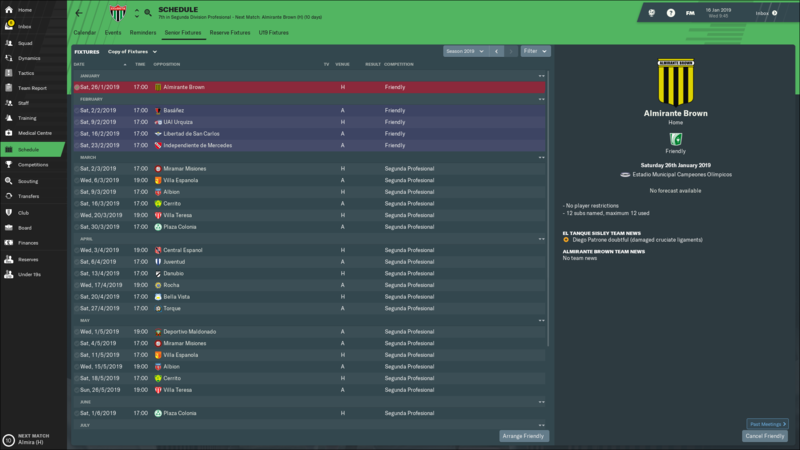 Below you can see the transfer overview, yet to be determined if I've made good signings or not. Also there is the board expectations (avoid the drop) and the club's history. I don't really consider performances in pre season as a measure really mate, as long as you play well in the regular season you're in with a shout of staying up. For sure. Our opening fixtures are fairly kind, against a few teams that many would expect to be around us at the bottom. All the reason to be confident then mate. AM sure you'll have some good performances. 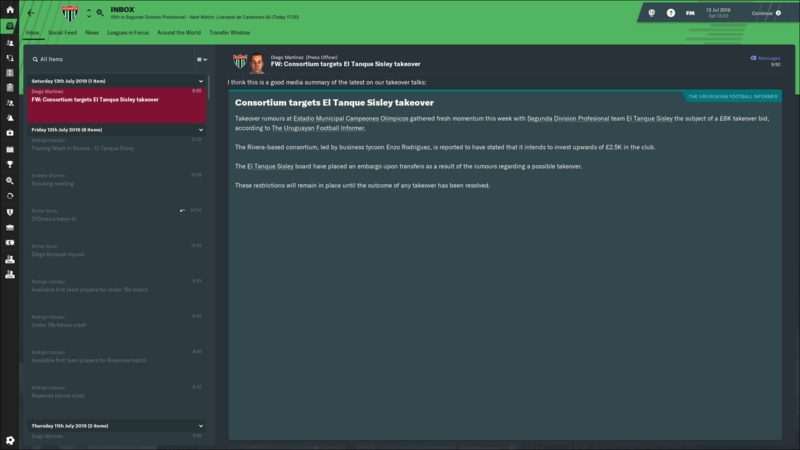 The moment has arrived, my first campaign as El Tanque Sisley boss begins with six Segunda División fixtures. I wasn't sure what to expect coming into it, I was only hoping for positive performances - anything else was going to be a bonus. Thoughts: Defeat in match one. Pretty even match overall, but one that was only going to end one way - late winner for them. Thoughts: As the screenshot states, we got lucky in game two after securing our first win of the season. 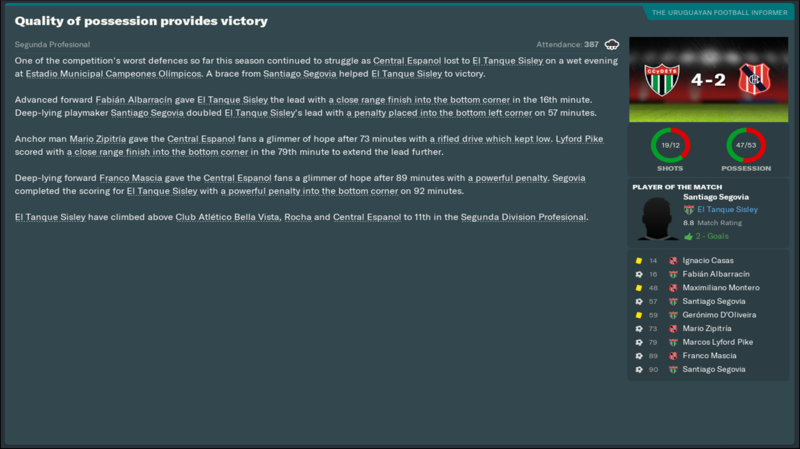 Santiago Segovia's penalty gave us a big win. 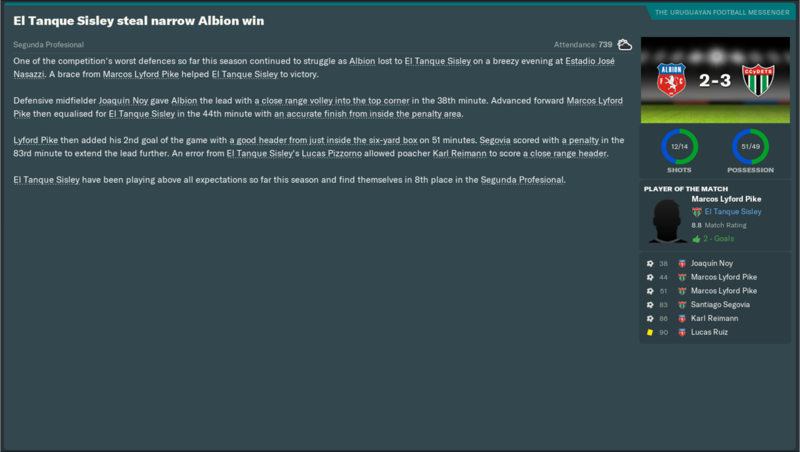 Thoughts: Albion beat us in game three, in what was a frustrating game to watch. Their opener was an OG and some horrific marking led to their second strike. 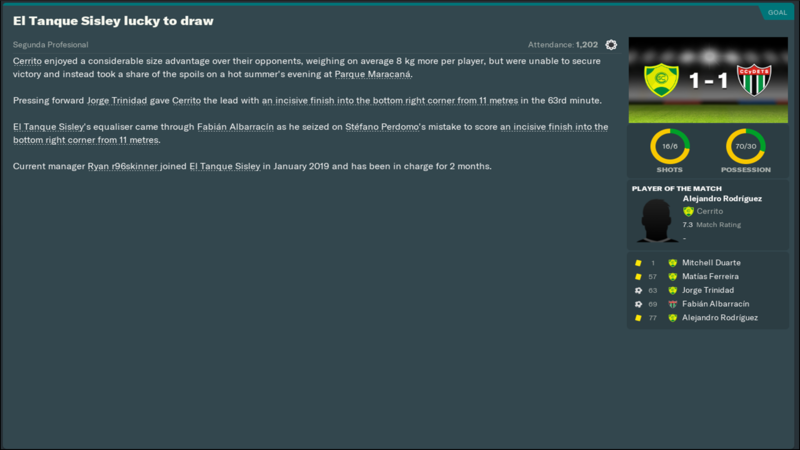 Thoughts: Decent point picked up away to Cerrito, they are likely to be a relegation rival but they did beat Danubio on the first matchday so I was content. 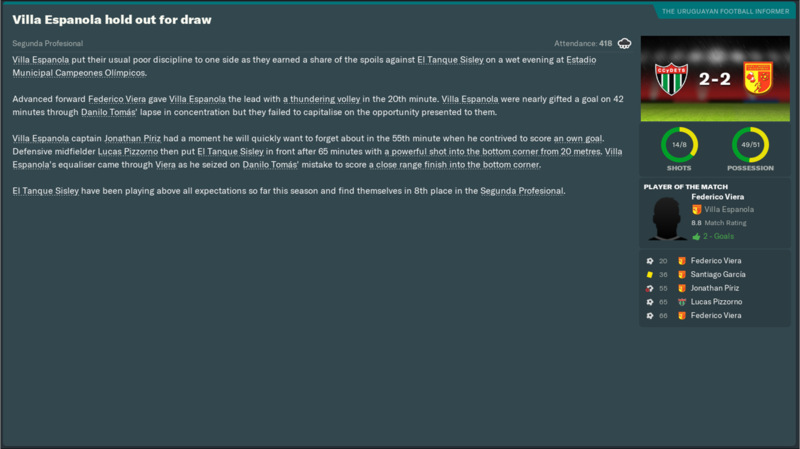 Thoughts: Narrow loss in March's penultimate fixture, not much to say about that match - Villa Teresa deserved to win. 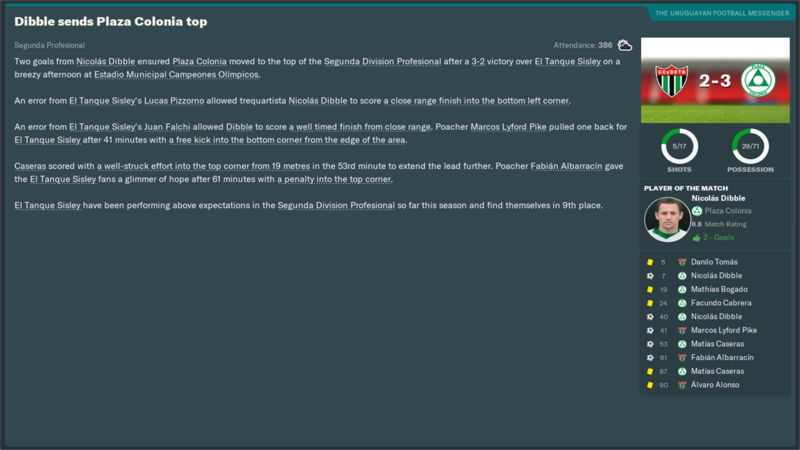 Thoughts: Plaza Colonia inflicted our fourth loss of the season on 30 March. Expected, their goalscorers alone are far too good for this level; both have recent experience in the Argentine Primera División. Recap: I am great at Football Manager, as you can see. 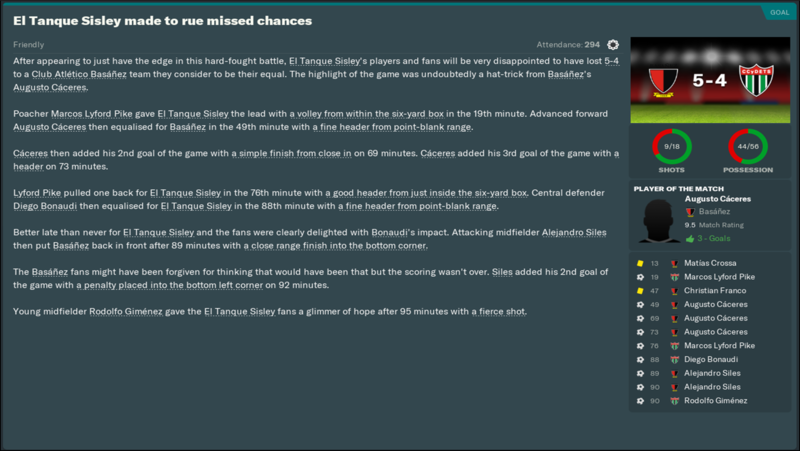 I just can't get going in this save yet, I know it's early days but this is going poorly so far with El Tanque Sisley. Performances haven't been disastrous, but nor were they with Sud América and look how that turned out. 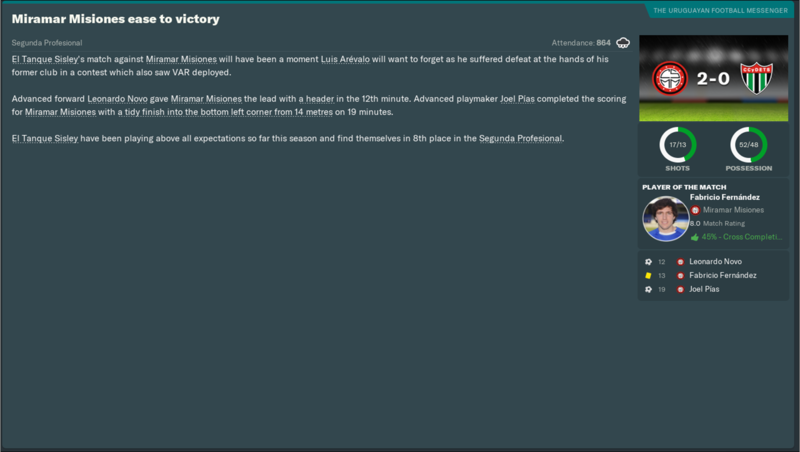 This is the way it goes sometimes in Journeyman saves, on FM17 I got early success in Asia with Albirex Niigata (S) and everything rolled right from there. 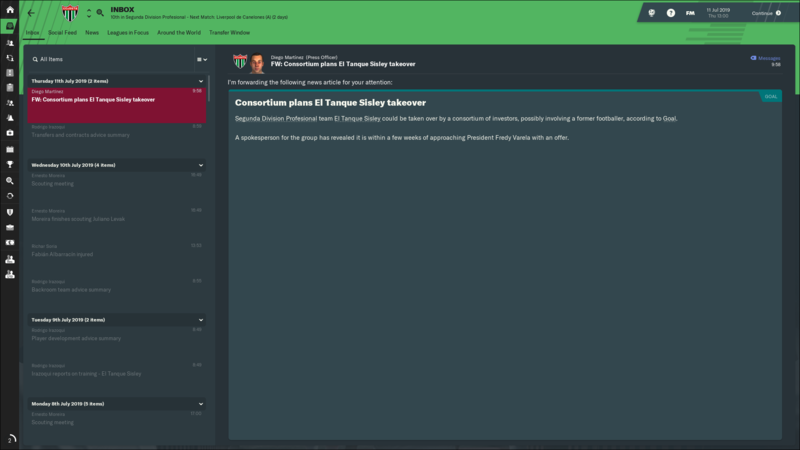 On FM19, it's a big struggle. 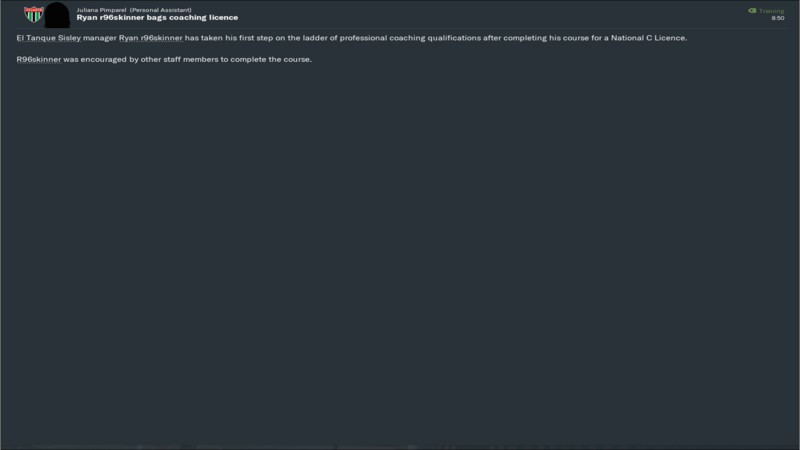 All part of the 'fun' though, if you're wanting to read a successful Journeyman then this isn't the post! March's results leaves me in a familiar position, bottom of both the regular season table and the average points table. On the plus side, if this carries on and I get the boot at least I won't get a relegation tally added to my résumé - all about taking the positives! 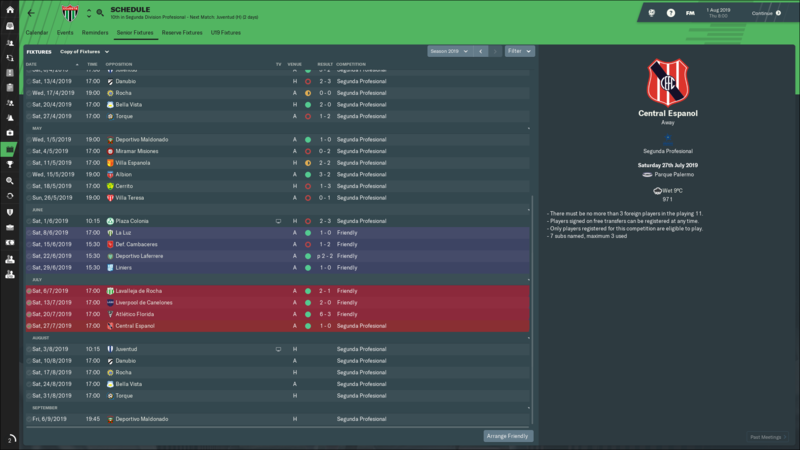 Not a good start, but I'm sure you have enough to turn your fortunes around! Nice to see someone else in Uruguay! You're more confident in my abilities than I am! 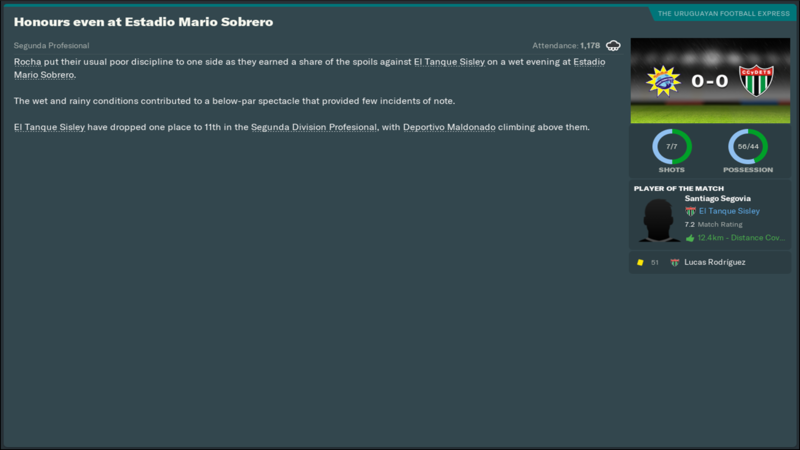 Indeed it is, I actually like managing in Uruguay despite my troubles thus far. March was woeful, there's no doubting that. Last month's form left us bottom of not only the regular season table but also the average points table. 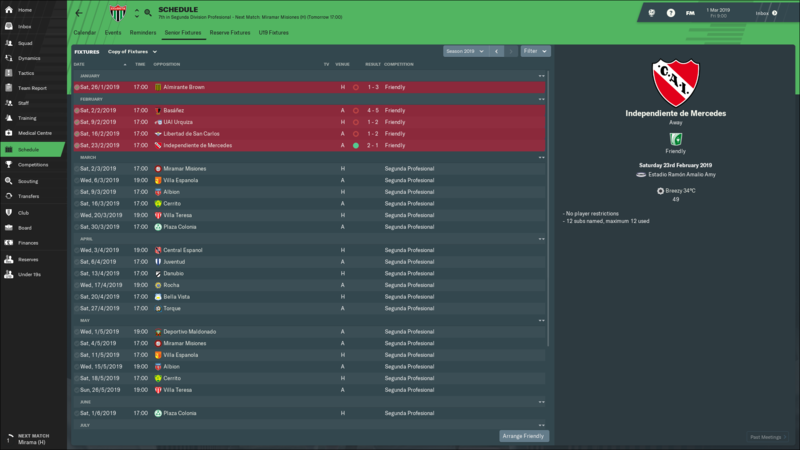 April must've been better, as we faced six matches in the Segunda División; three were against promotion-chasing Juventud, Danubio and Torque, while the other three were versus our relegation rivals Central Español, Rocha and Bella Vista. Quite the contrast. 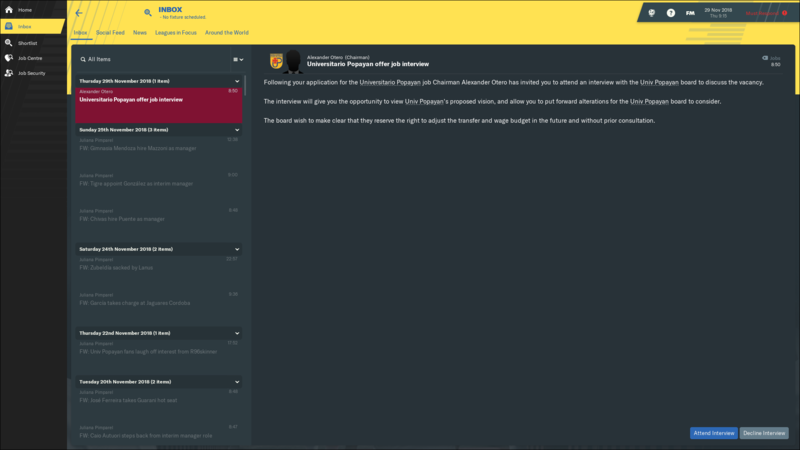 Thoughts: Brilliant beginning! 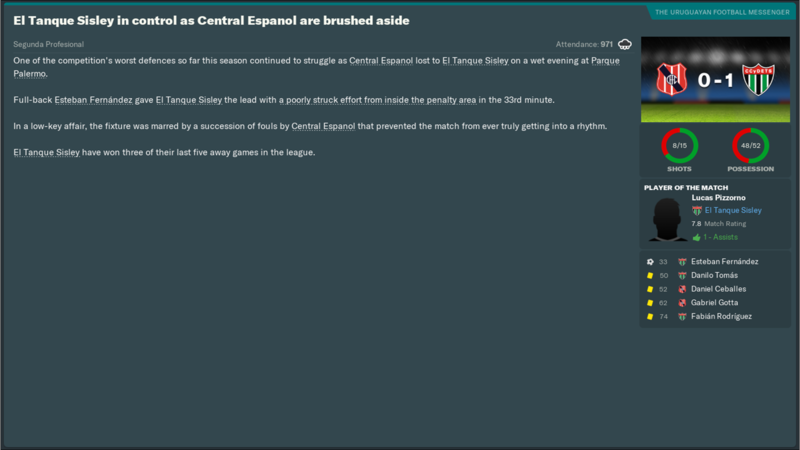 Vital three points over expected positional rivals Central Español, they made us work for it in the second half but we thoroughly merited the victory. 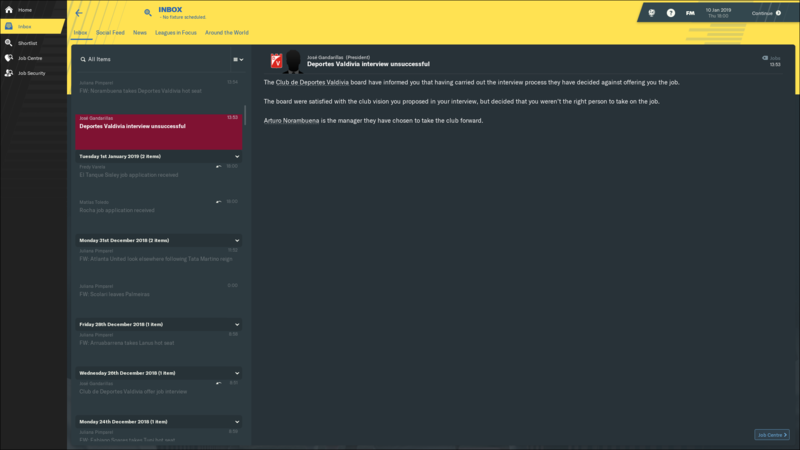 Thoughts: Absolute scenes! Stunning performance away to the then league leaders. We were three goals (!) ahead at the interval, we were then forced to hold on as their expected onslaught arrived in the second half but the lads dug in deep and kept the points. What a result! 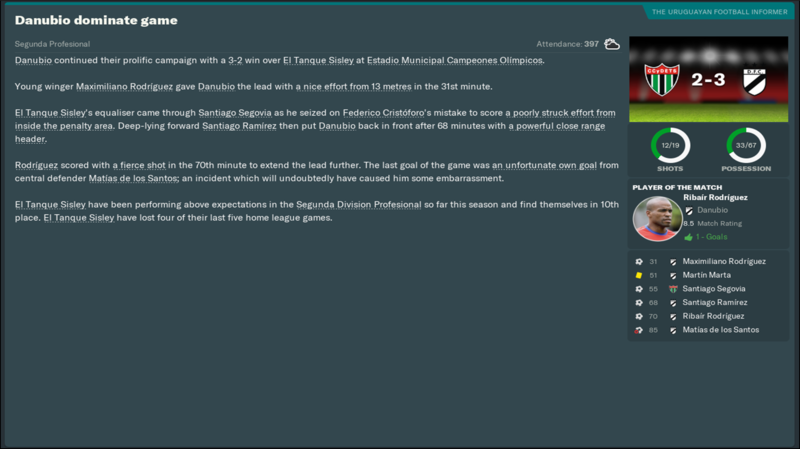 Thoughts: After Juventud, we faced the new league leaders at the time - Danubio, a sizeable test at any stage. We would lose the game 2-3, but it was another proud performances from the team. They never gave up, got a goal back late on but we just ran out of time. Top effort nevertheless. Thoughts: A trip to competitors Rocha gave a welcomed point, we probably should've taken all three as we were marginally the better team. But, hey, we keep our distance from the team below us which I see as a positive step. Thoughts: We made no mistake against Bella Vista, a fellow rival. 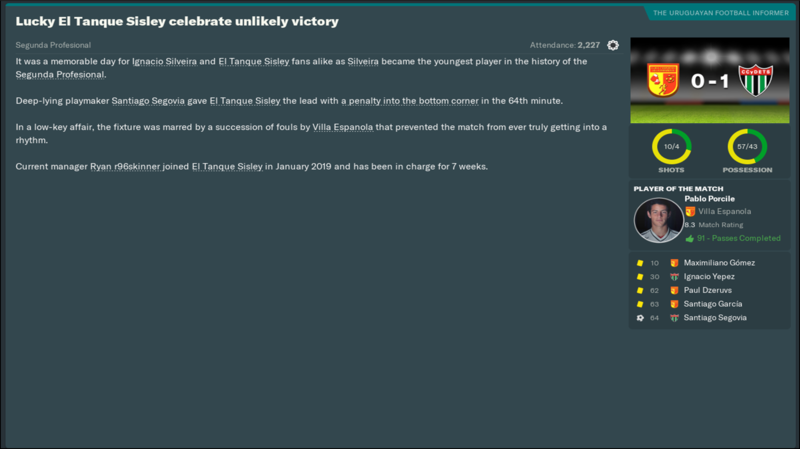 This victory was never in doubt, the game was pretty much dead after we went two goals ahead after twenty-one minutes. Important win, which also makes the Rocha point look better. Thoughts: April ended with defeat to second place Torque. 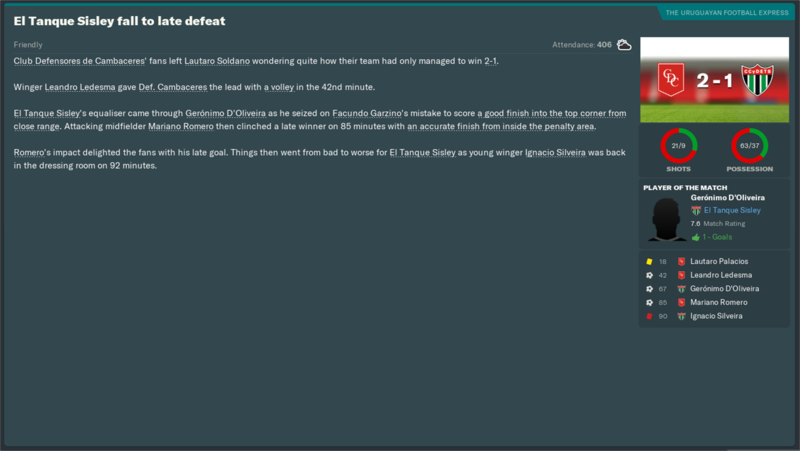 We gave another great account of ourselves, but Torque were superb and deserved the eventual win. We made them work for it, though. Recap: Fantastic month! I couldn't have asked for more, the squad have been absolutely fantastic and made sure we were giving 100% in every match. 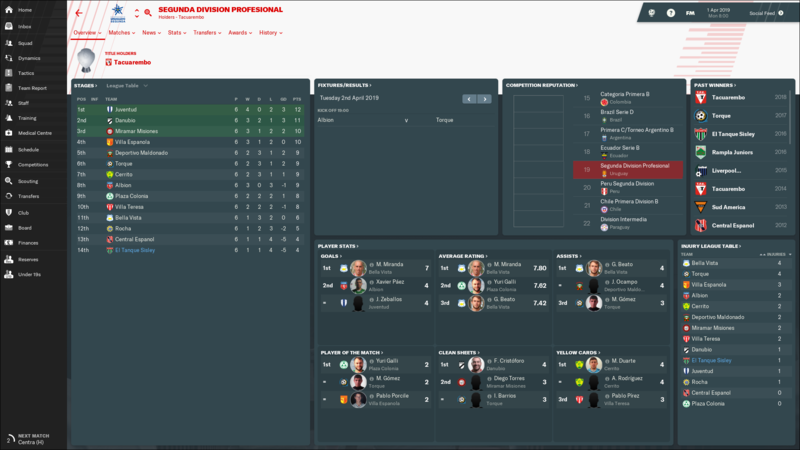 This run of form makes the tables look so much more encouraging. We sit 10th in the regular season standings, while we're one better (9th) in the average points table. Every month won't be like this, but we must keep picking up a good amount of points every month to keep the gap between us and the bottom two. March was pretty bad but at least you gained some momentum in April with a couple of wins. Massive result over Juventud though which means your team can play well just need to find some consistent form. Yeah, April was very promising - things weren't looking good in March, shows how quickly it can change. April 2019 went well, meaning for the first time this save has been enjoyable to play. 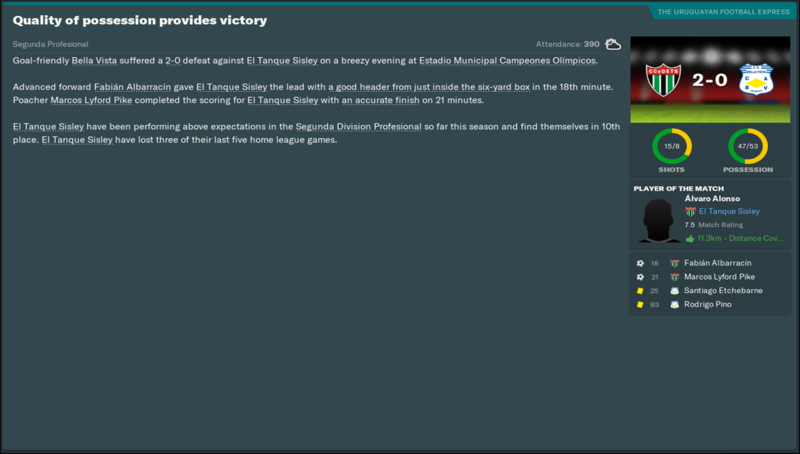 We aimed to continue the form into May, which had my El Tanque Sisley team take on six league fixtures. Thoughts: Lovely way to start May. 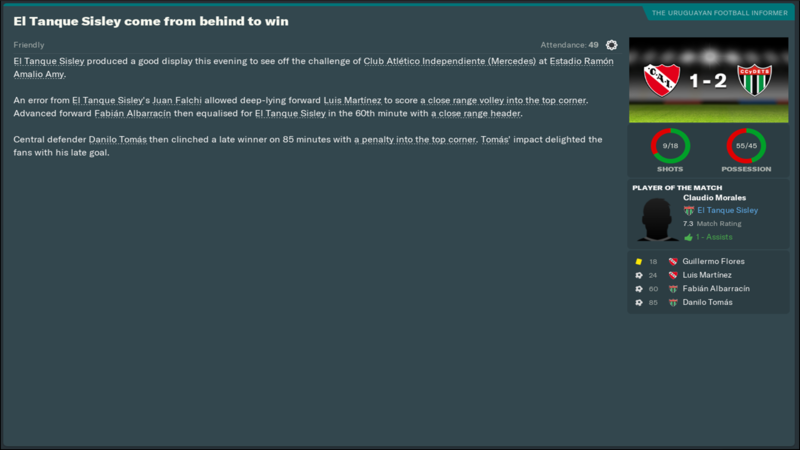 Fabián Albarracín popped up with a 49th-minute winner, to defeat a positional rival. 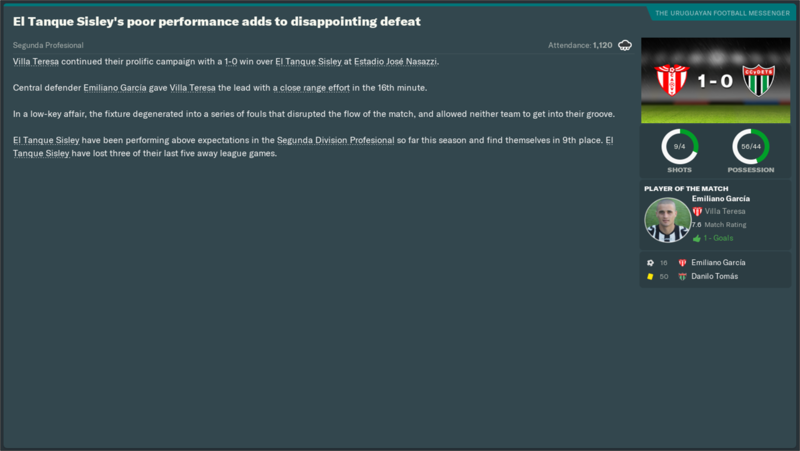 Thoughts: A disappointingly straightforward loss to higher placed Miramar Misiones, we didn't really trouble them. Thoughts: Another side close to us in the current standings, I thought Lucas Pizzorno had scored a potential match-winner on 65mins but the visitors struck back literally instantly to grab a point. Should've won that. Thoughts: Albion, a team nearer the bottom, was a match we simply had to win, to keep ahead of the relegation threatened clubs. 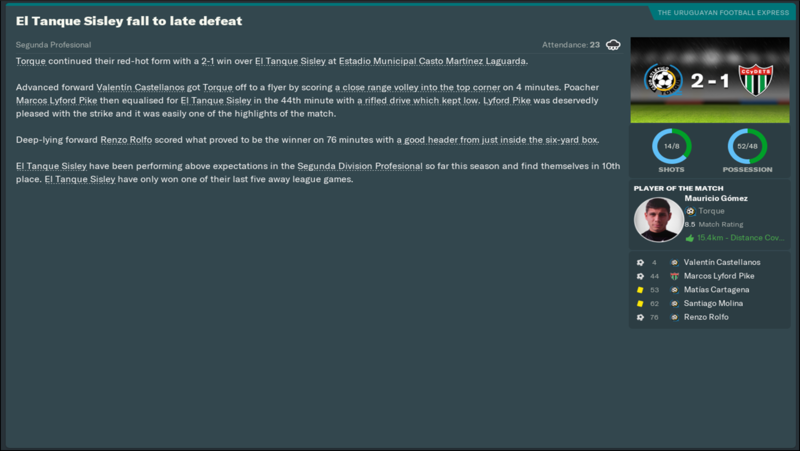 Thankfully, after a brace from Marcos Lyford Pike and a strike from Santiago Segovia, we collected all three points; despite making the scoreline look closer than the game actually was. 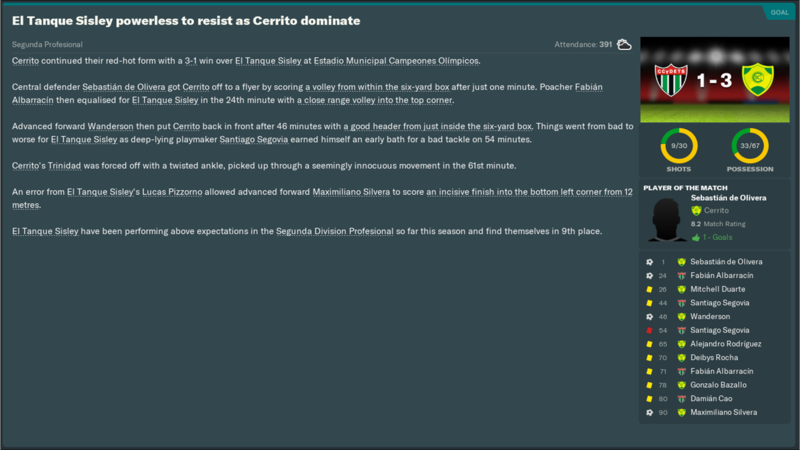 Thoughts: May's penultimate fixture ended in defeat to a rejuvenated Cerrito. As you can see above, they absolutely dominated us from start to finish - that's despite them being a team that finished second bottom in the regular season last campaign, they're now second top! Stunning turnaround! Thoughts: Villa Teresa also beat us. They are a team that is, again, above us in the standings so a result like that wasn't unexpected. Recap: Two wins, one draw and three defeats. 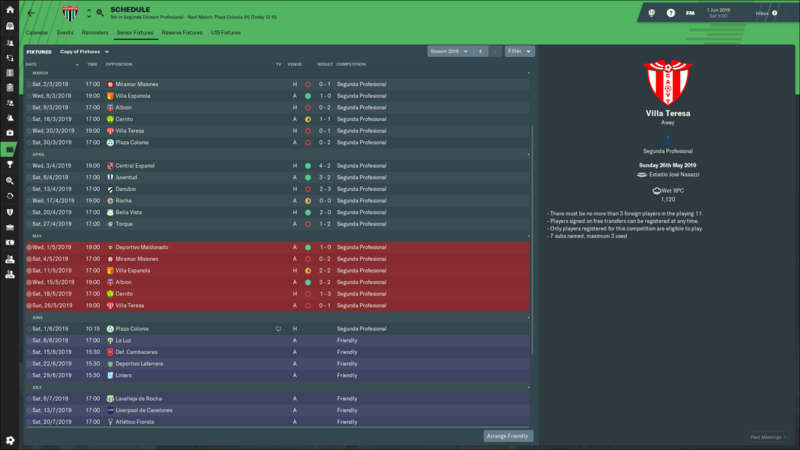 Not the greatest month admittedly, but all the matches we didn't win were versus teams above us in the table - they aren't our competitors, teams like Deportivo Maldonado and Albion are, who we beat. We sit 9th (regular) and 10th (average), a good amount of points above the teams fighting relegation. If we remain around here for the rest of the campaign, I'll be very happy. 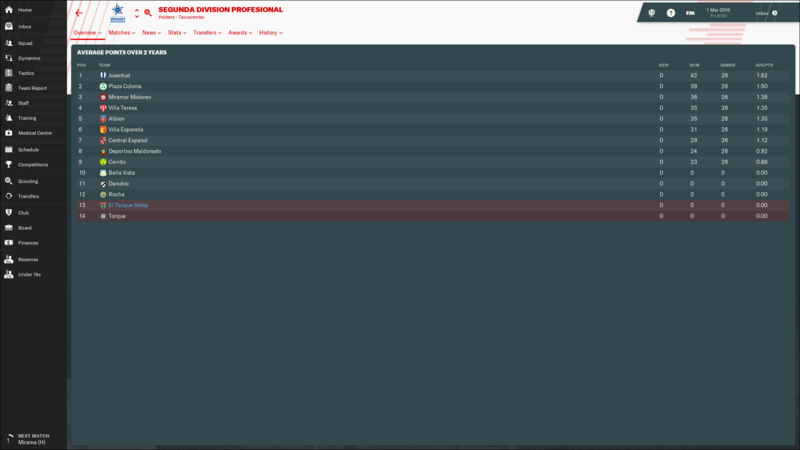 The next two months are pretty dull, with only two Segunda División fixtures to be played; lots of friendlies set. Not long until the season's end though, just eight more fixtures left to fulfil. 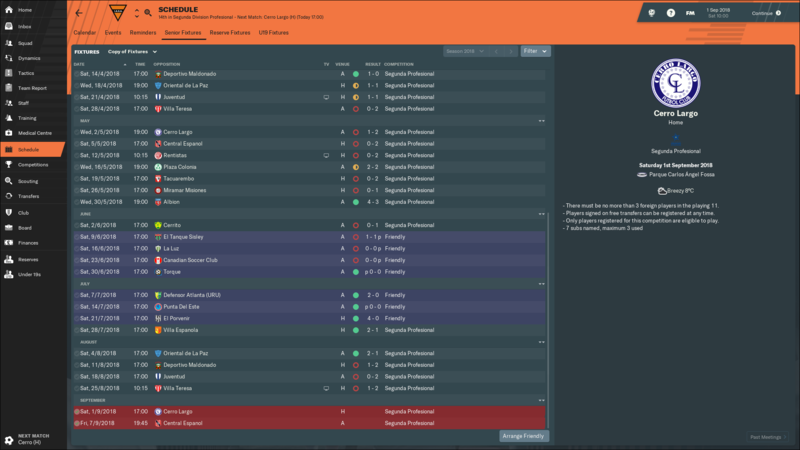 Our only goal is to avoid the drop, which would be a big plus for the club and for me. 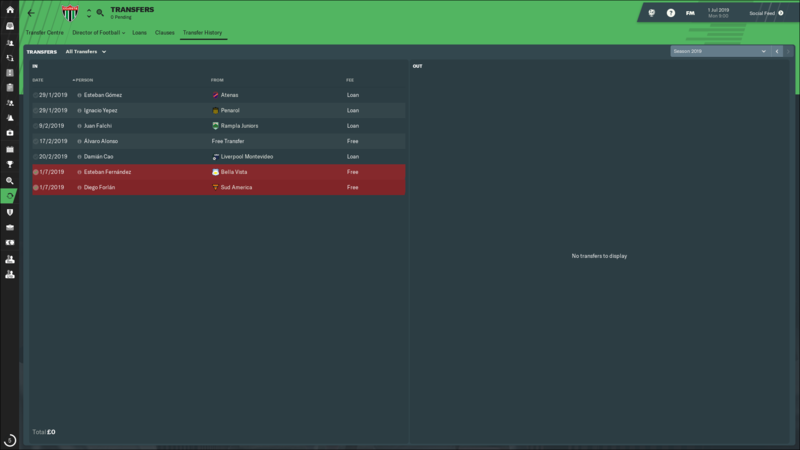 The 2019 season slows down a bit this month, with just one Segunda División fixture set alongside four friendlies. 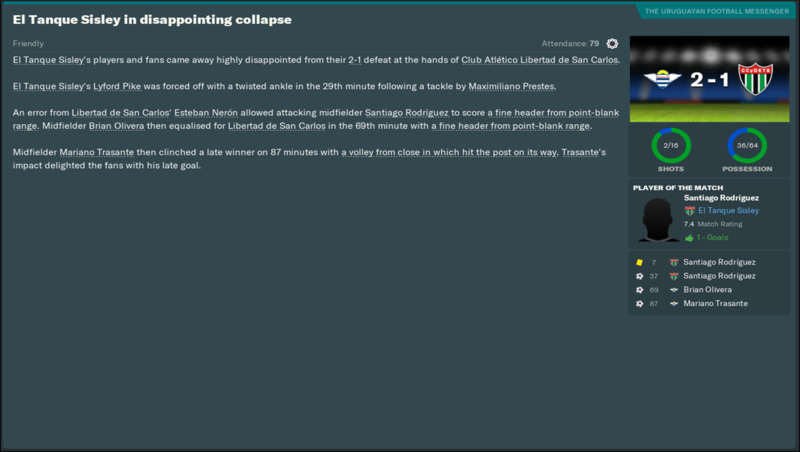 Thoughts: Our only competitive fixture in June ended with a spirited but deserved loss to promotion-chasing Plaza Colonia. Said it before, they're too good for this level. They bossed us but we kept the scoreline close which was a positive. 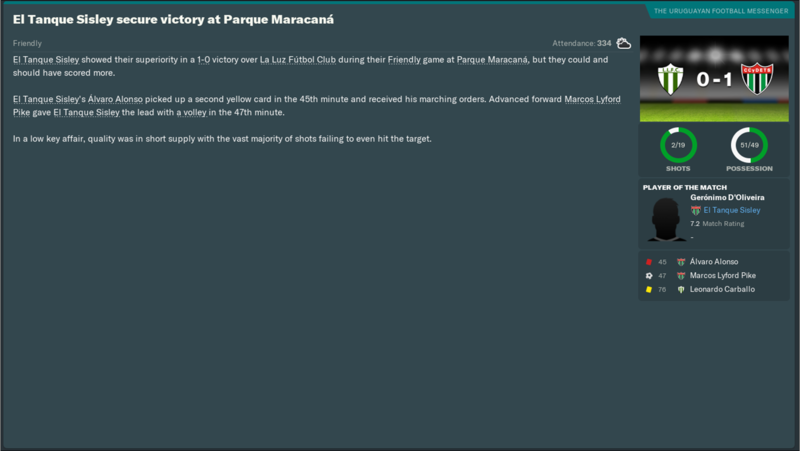 Thoughts: Opening friendly win thanks to a Marcos Lyford Pike strike, despite going down to ten men minutes prior. 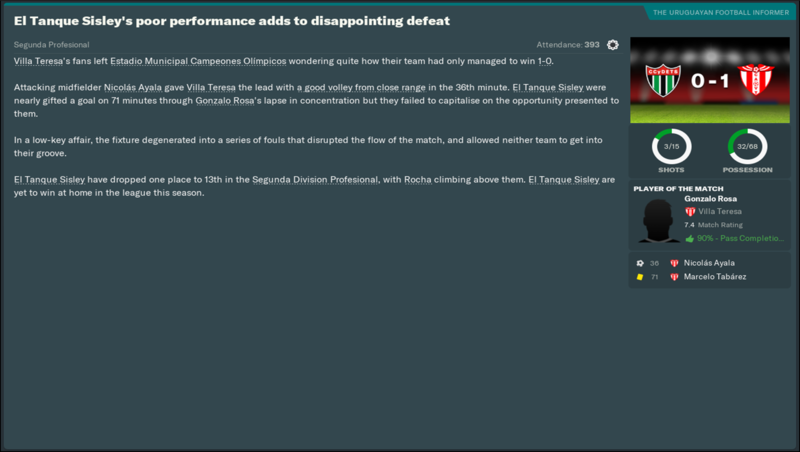 Thoughts: First of a triple-header in Argentina, Cambaceres defeated us on their patch as we again had a player sent off. 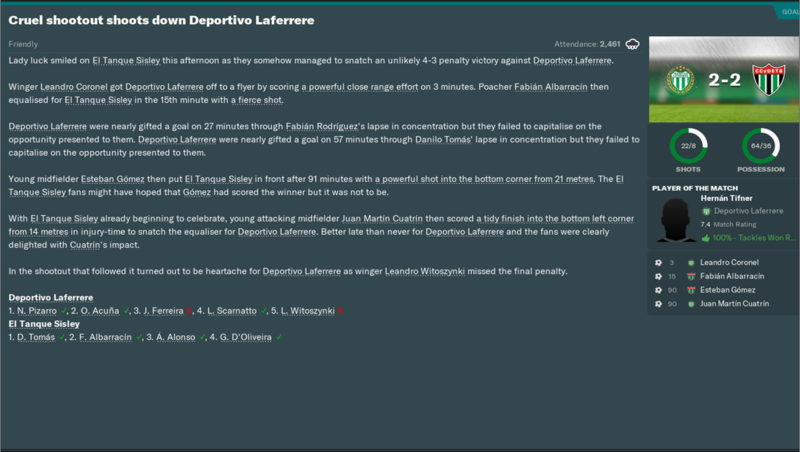 Thoughts: We should've beat Deportivo Laferrere, especially after it looked like we scored an injury time winner until they got an instant highlight after our goal - nothing can be done in those situations. 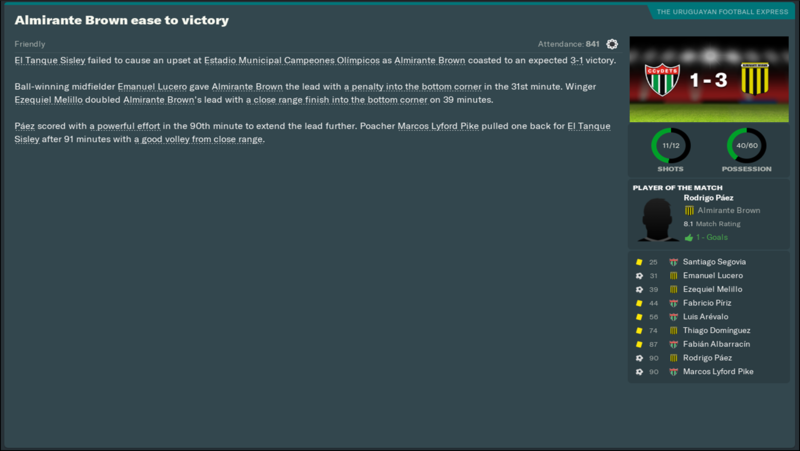 Thoughts: Our little Argentina mini tour ended with a victory over Liniers, that man Lyford Pike scoring the game's crucial goal. Recap: Not much more to say. Yes, we did lose our sole competitive match but it was against a team we expected to. 10th/11th are our current standings, with the latter being the average points table. 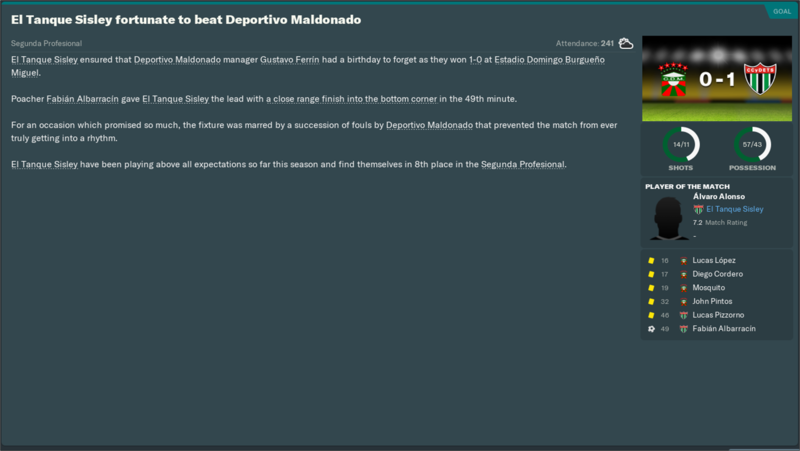 July 2019 will be similar to this month, again just one fixture in the Segunda División. B: The board have every confidence in me at the moment, defining my job status as 'very secure'. Looks like things are going smoother this time around! For sure, at the moment at least! Doesn't take much for things to change though. The season's final friendly period is drawing to a thankful close, there were three more to face this month but July did end with the return of Segunda División football against Central Español. 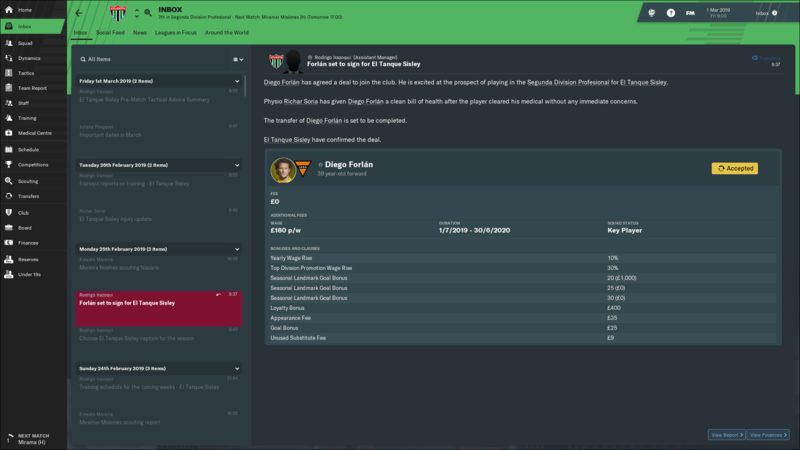 Diego Forlán has belatedly joined, so the 40 year old was sure to give us some sort of boost. Let's go! 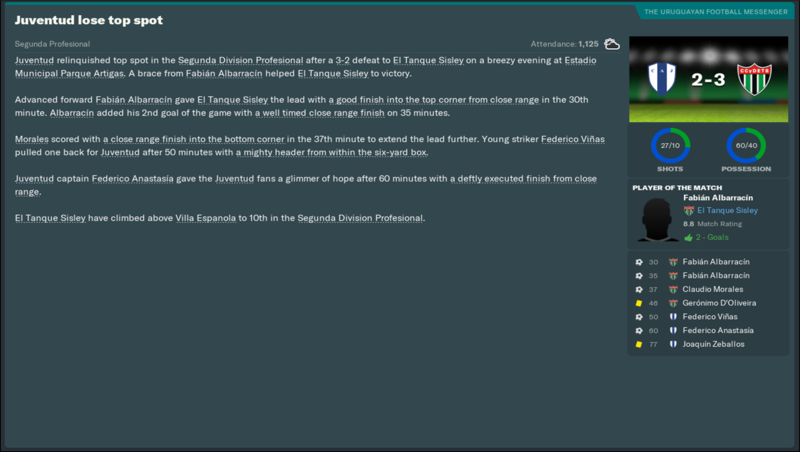 Thoughts: Positive first match for Mr. Forlán, with the veteran notching the first goal in a 1-2 win; Santiago Segovia with the eventual winner. 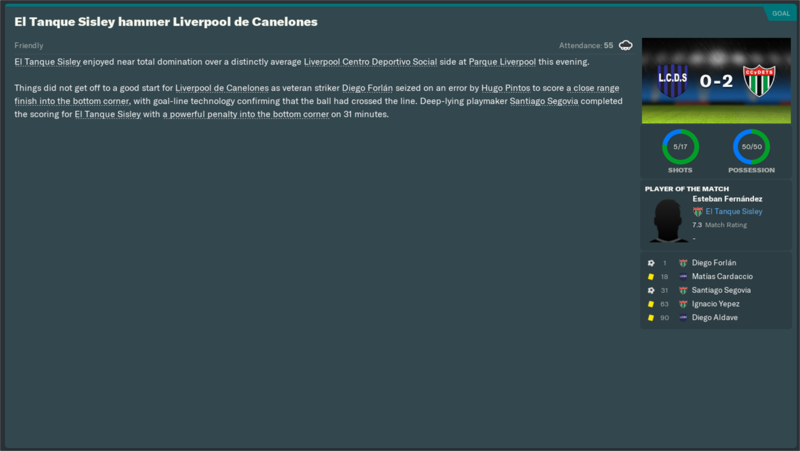 Thoughts: Forlán and Segovia at it again, as this time we kept a clean sheet over Liverpool Canelones. Only friendlies against lowly opposition, but good to see Forlán still has it! 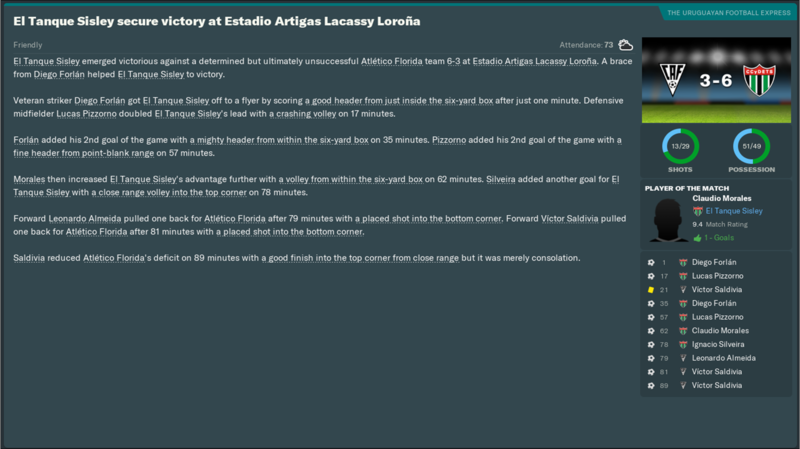 Thoughts: Nine-goal thriller with Atlético Florida in our final friendly. 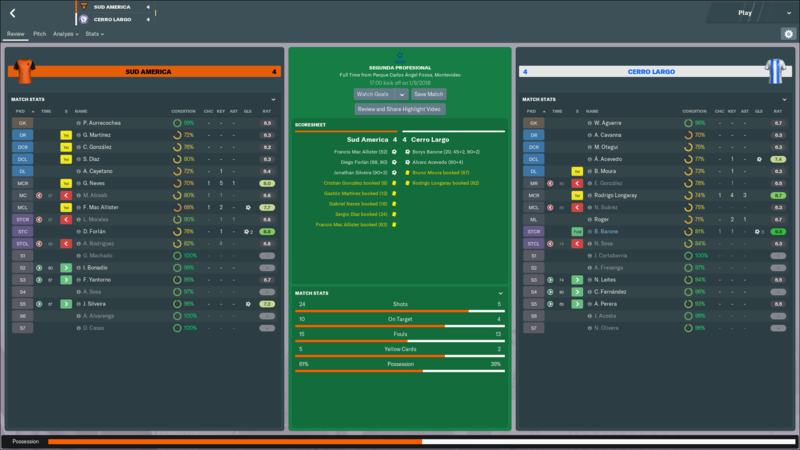 The scoreline flatters them extremely, scored all their goals when I was forced into an improvised 2-2-2-2-2 in order to protect my players fitness; which actually worked as we didn't suffer any key injuries. 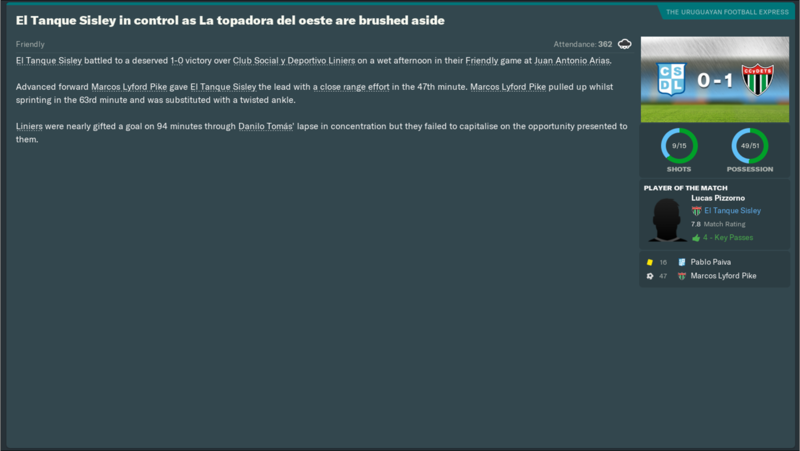 Thoughts: The big match of this period ended with a key victory over relegation threatened Central Español. A new signing stole the show but it wasn't Forlán, fellow new arrival Esteban Fernández scored the game's winner. Had to take three points here, which we did. 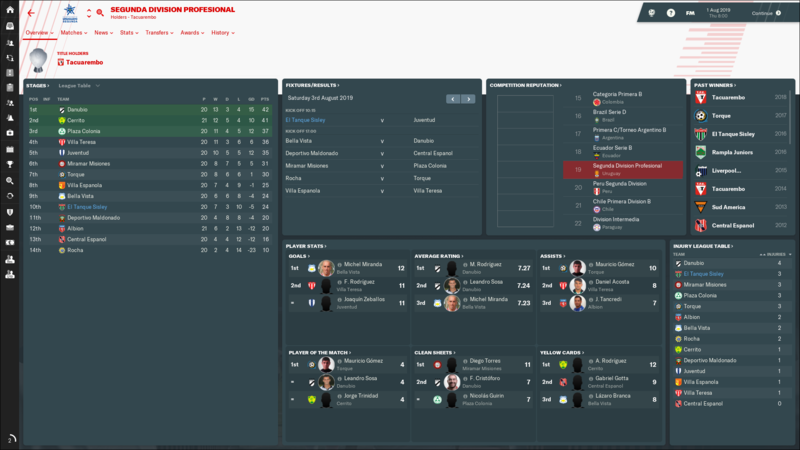 Recap: So, overall it was four straight wins in July but the only one that mattered was the last one played, which leaves us 10th in both the regular season table and average points table. 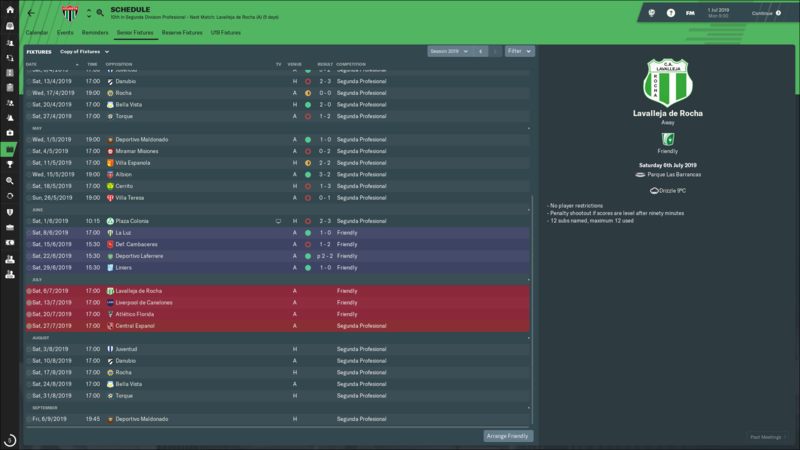 We are looking good in completing our objective of avoiding the drop, but I certainly won't be getting carried away with still six fixtures left to participate in.